Mumbai: ICICI Bank announced that it has crossed the milestone of 20 years of pioneering digital banking channels in the country, starting with internet banking, which it launched in India in 1998. The Bank was also the first to launch its mobile banking application, iMobile, in 2008 alongwith being the first bank to introduce a digital wallet in the country in 2015 among many other firsts in its journey of digital innovation. Today, the Bank’s internet and mobile banking platforms offer are most comprehensive with over 350 and 250 services respectively. To celebrate this unique milestone, it unveiled an array of design-thinking led futuristic & industry-first services in iMobile to bring in the next-level of customer experience. It includes the country’s first and only software robotics algorithm led investment advisory application on mobile, ‘Money Coach’. It manages the entire investment journey of a customer from building an investible corpus to investing in recommended portfolios and tracking it 24x7. It also brings in a paperless KYC and online registration process for mutual funds in a single click, which is a first among banks. This facility brings in a new level of convenience and experience to customers as it replaces a lengthy and paper-intensive process of registering their KYC for mutual funds. Talking about the milestone, Mr. B. Madhivanan, Group Executive and Chief Technology & Digital Officer, ICICI Bank said, “We are proud to share that our journey of pioneering digital channels has completed the milestone of 20 years, a first in the industry. As we look back, in the last two decades, we have focused on leveraging new trends in digital technology, mobile communications and social media. We saw India’s demographic dividend and the rapid strides in mobile technology years back and anticipated the disruption that mobiles would bring in to the society as a whole and also banking in particular. We predicted that we will witness shift in consumer preference towards doing everything ‘on-the-go’. This vision and belief actually led us to launch both, the country’s first internet banking in 1998 as well as the mobile banking application ‘iMobile’ in 2008 and bring in many innovations in it. As a testimony to the Bank’s comprehensive offering, iMobile was the numero-uno in mobile banking in terms of value of transactions in FY18 (As per RBI data, April 2017 – March 2018). It had a market share of 34% with transactions worth Rs Rs 4.09 trillion in FY’18. Further, ICICI Bank secured the top spot in the report - 'The Forrester Banking Wave™: Indian Mobile Apps, Q2 2018', by the marquee American research agency, Forrester. It has received these citations on the bank of extensive functionality, user experience coupled with exceptionally strong assisted-service features. The report also counted iMobile as among the world's best. · Money Coach: A software robotics based automated personal finance and investment advisory platform which helps customers plan their future investments in a seamless manner. The service is offered free of cost and enables goal based investment advisory. After the introduction of this facility, the Bank has witnessed manifold increase in customers investing through iMobile. · ‘Discover’, one view dashboard with spend patterns: Another first of its kind feature, it displays transactions across all savings account, credit cards and Pockets wallet held with the Bank in one place. It offers a host of services such as a consolidated statement of transactions done through the year, a graphical representation of spending patterns, suggestions for future transactions based on past transaction records as well as an option to track deliverables and service requests. · 3D Touch:This feature allows users to initiate transactions such as bill payments, fund transfer or scan a QR code by simply long pressing the iMobile icon. · In app merchant payments: With this feature, customers can make instant payments for day-to-day transactions such as ordering food, hotel bookings, travel etc. from within iMobile, directly from their bank account. · Instant digital credit: Itenables customers to buy small ticket items immediately in a completely digital and paperless manner. Using the facility, customers to shop online, pay bills and pay to any merchant UPI ID at physical stores instantly. · Securing card transactions:ICICI Bank is the first bank in the country to enable users to pre-set limits on their credit and debit cards for domestic as well as international transactions. Additionally, the Bank has recently introduced a new feature in iMobile that gives customers the power to control the security of their cards from their own phones at just the flick of a button, 24x7. · Swipe to check balance:Customers can now check their account balance without logging in to the app. Customers can swipe on the non-logged-in page to glance through their account balances and credit card outstanding amount. · Favorite Transactions:This particular feature allows users to tag their frequent transactions as ‘Favorite’ that enables seamless payments in future. The upgraded app is available for download on Google Play store and Apple app store. Any ICICI Bank savings account customer, who has a mobile number registered with the Bank can download the iMobile application. The Bank has witnessed significant growth in mobile banking on the back of its customers shifting to mobiles for undertaking transactions like fund transfers, payments using UPI as well as merchant and bill payments. Its numero-uno position can be attributed to many innovative services such as instant credit card & personal loan, payment of advance tax from iMobile and purchase of health & travel insurance among others, which have also contributed to the rise in adoption of mobile banking. 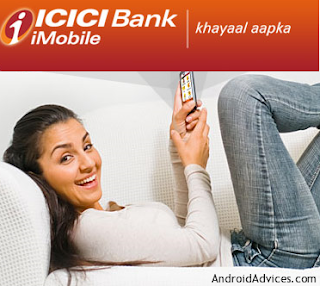 ICICI Bank was the also first bank in early 2017 to introduce chatbot led services on its website, mobile banking application, iMobile and its digital wallet, Pockets. In addition to offering instant responses to queries, the iPal engine on iMobile undertakes financial transactions as well – an industry first feature. Overall, iPal now handles 1.4 million queries a month with an answer rate of 90%.